The Nevada Breath Alcohol Program is a state program regulated by the Nevada Revised Statute (NRS), chapter 484C, and the Nevada Administrative Code (NAC), chapter 484C. 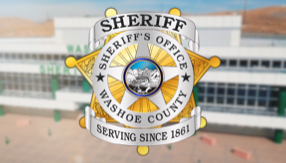 The program is overseen by the Committee on Testing for Intoxication and administered by the Washoe County Sheriff’s Office Forensic Science Division (WCSO-FSD) and the Las Vegas Metropolitan Police Department’s Forensic Laboratory (LVMPD-FL). The Breath Alcohol Program provides a cost-effective and non-evasive means to perform evidential alcohol tests in accordance with the NRS and NAC. The Breath Alcohol Section of the WCSO-FSD is responsible for providing the services of the Breath Alcohol Program for 13 counties in Northern and Central Nevada. There are currently over 35 Evidential Breath-Testing Devices (EBT) used by over 30 different agencies in these counties. The Breath Alcohol Section is responsible for the calibration and maintenance of the EBTs, preparation of aqueous solutions of ethanol, verification of gas standards, and the training and certification of breath testing operators. Analysts in the Breath Alcohol Section also testify to the calibration of the instruments, preparation or verification of standards used with the instruments, training and certifications of the breath testing officers, basic operations of the instruments, effects of alcohol in relation to completed breath tests, and the validity of the instrument operation during breath tests. The breath testing procedure is designed to provide a series of safeguards to ensure that the results obtained during an evidentiary breath test are both accurate and reliable. A checklist is used with every test to ensure that these safeguards remain in place and that all breath tests are conducted in the same way. The EBT currently used in Nevada is the Intoxilyzer 8000. These instruments use Infrared Spectroscopy to analyze the concentration of alcohol in a person’s breath. The Intoxilyzer 8000 also has a number of safeguards built into the software and the design of the instrument to ensure that the results obtained are valid and accurate. Preliminary breath testing devices (PBTs) are typically hand-held, battery operated devices meant to be used in conjunction with the standardized field sobriety tests or other situations where an evidentiary test is not necessary. There are many different types PBT used in Nevada. PBTs must be calibrated and used in accordance with the Nevada Administrative Code and the Nevada Revised Statute. 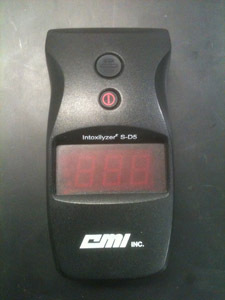 Evidentiary Breath-Testing Devices must be calibrated at least once every 90 days by a certified Forensic Analyst of Alcohol. 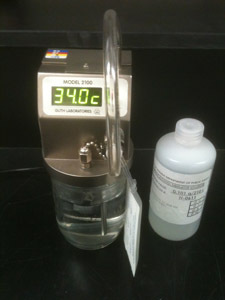 The calibration must include the instrument’s response and accuracy to at least three different concentrations of alcohol. Various diagnostic checks recommended by the manufacturer are also performed during the calibration. All data from the calibration is documented in an instrument specific record. All instrument records are maintained by the Breath Alcohol Section. Preliminary Breath-Testing Devices must be calibrated once a year by the agency. The calibration must include the PBT’s response and accuracy to at least three different concentrations of alcohol and an alcohol free sample. A monthly check using one concentration of alcohol must also be performed by the agency to verify that the PBT is working properly. The Certified Simulator Solution is an aqueous solution of ethanol used to verify that the EBT is working properly immediately before an evidential breath test. The solution is prepared and then analyzed using Headspace Gas Chromatography by the FAAs within the Breath Alcohol Section. Each batch of solution has a unique lot number and is given a certified value based on the results from the analysis. The solution is placed into a device called a simulator. The simulator and solution are used to simulate a breath sample with a known concentration of alcohol. The EBT analyzes the sample from the simulator to verify that the instrument is accurately determining the concentration of alcohol with every test. The Certified Gas Standard is a dry gas mixture containing a concentration of ethanol in nitrogen. The standard is purchased by an accredited vender and the concentration is verified by the FAAs within the Breath Alcohol Section. The gas is used in the same manner as the Certified Simulator Solution. 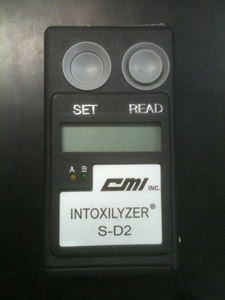 The EBT analyses a sample of the gas with every breath test to verify that the instrument is accurately determining the concentration of alcohol. Please be aware that classes will only be scheduled when there are enough students to fill a class and it may take a several months to schedule a class for certain areas. Classes will not be scheduled for all locations and the class location will depend upon facility availability and class demand. Operators must attend and complete the Intoxilyzer 8000 Certification Course in order to operate the Intoxilyzer 8000. The class is approved by the Nevada Peace Officers’ Standards and Training and the Committee on Testing for Intoxication. The operator’s certification is valid for three years. A recertification course must be completed in order to maintain certification. Operators that have completed the initial four hour Intoxilyzer 8000 Certification Course and have not expired past the six month are eligible to attend a 2 hour recertification course. This class is approved by the Nevada Peace Officers’ Standards and Training and the Committee on Testing for Intoxication. Completion of this course will recertify the operator for another three years on the Intoxilyzer 8000. The PBT Instructor Course is designed for specific PBT models and each class will be tailored for the PBT(s) used by the agency or agencies attending the class. The students will be trained on how to properly calibrate the PBT(s) in accordance with the NAC, the manufacturer requirements, and the recommendations of the FAAs. The students that attend this course will be trained and approved as a PBT instructor. PBT instructors will be able to train officers only on the type of PBT(s) that were taught during the instructor course. PBT instructors will have to attend additional courses to become instructors on new PBT models. There is no recertification requirement for a PBT instructor; however, it is recommended that the PBT instructors attend this class as a refresher every few years. The PBT Instructor Course is an all day course that is restricted in class size and is only taught a couple times a year. Students attending a PBT Instructor Course may be asked to bring at least one PBT to class. The PBT Calibration Course is designed for specific PBT models and each class will be tailored for the PBT(s) used by the agency or agencies attending the class. The students will only be trained on the calibration of the instruments and will not be approved as instructors. The class will cover the NAC, the manufacturer requirements, and the recommendations of the FAAs. It is recommended that smaller agencies have at least two people trained in PBT calibration and three to six people trained for the larger agencies. Students attending a PBT Calibration Course may be asked to bring at least one PBT to class.